More generally, there is collectivist authoritarianism reduced to it’s bare essence. Let Canada feed them. Africans love Canadians; especially bbq’d over an open fire. White guys left and took their magic dirt with them. I think I’ve predicted that happening.. as have others. We commenters and bloggers are seemingly much smarter than all the eggheads in government and think tanks combined. Why else did noone warn Mugabe that there would be no aid forthcoming if he deliberately drove white farmers off their land and then turned the country into a basket case begging for handouts. Let’s see, now — there was the Soviet Union and all of its satellite countries (I include Cuba here); we have had Venezuela, and now Zimbabwe. I guess that it still “hasn’t been done right”*. * That comes from “That’s because it hasn’t been done right” — the usual answer from EVERY believer in Marxism/Socialism/Communism,et. al., when they are informed that Marxism/Socialism/Communism, et. al., has NEVER succeeded on its own. How much is venezuela asking for? Just what they’re ‘entitled to’…of course. Because they can turn air into carbon dioxide and food into excrement, Marxists/Leftists/Socialists believe that everyone else who has more than them somehow “owes” them something. Nothing has changed. The Pilgrims tried socialism, and Plimouth Colony experienced mass starvation. They switched to a capitalist system, and then the colony thrived. Those who fail to learn from history are doomed to repeat it. Has it been determined yet whether this is Bush’s fault or Trump’s fault? This is what Marxism does for the value of the currency. Note the expiration date, a sure sign of a problem with the economy. 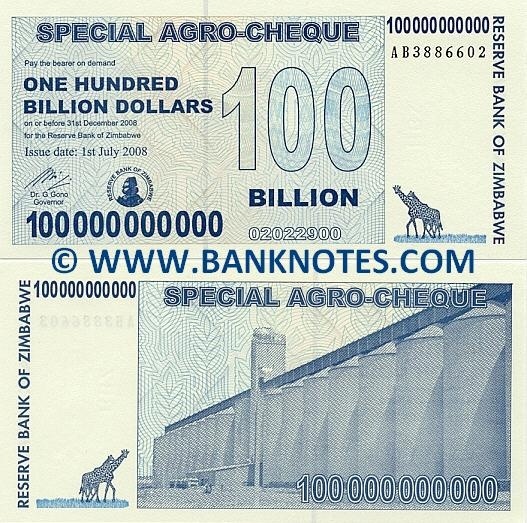 I have also seen $100 Trillion notes. Zimbabwean currency is worth less than toilet paper. Actually, this is Zimbabwe’s second time down the drain. From 1982 to 1990, GDP growth rates averaged 1.3 percent per annum while the population grew at an average of 3.3 percent. Only 10 000 new jobs were created in the first decade of independence, which did not keep pace with the population increase. The average annual growth rate of the Zimbabwean economy was 4.1% between 1980 and 1985, and 4.6 between 1985 and 1990. That puts Obama’s economy to shame and they STILL failed. By 1998 inflation was at 30% and within two years the entire nation collapsed. The occupation of farms which started in the 1980’s had reduced the agricultural output of the nation by nearly 75% by 2001. By then the former “breadbasket of Africa was importing $2.8B US per year in international food aid. This is Zimbabwe’s second collapse in the 35 years since it “freed” itself from white rule and capitalism. I say, let them eat cake. Hmm, sounds like Venezuela, North Korea, Iraq, Mexico, Pakistan, Cuba, etc. I’m detecting a pattern here. Bush I believe until Trump takes office. Then it will be Trump’s fault. Some ideas have long records of complete failure, yet people try them again and again. Venezuela’s meltdown has two of these ideas that have never ended well, but people keep trying them. First, Socialism never works. From Korea, Russia, Africa, to Latin America, it has never worked. But people keep wanting it. Venezuela has had a bad decade with their socialist experiment and within the last year the final domino has fallen. Their economy is in meltdown. When the price of oil plummeted, Venezuela could no longer afford their socialist programs and the state-controlled industries failed. 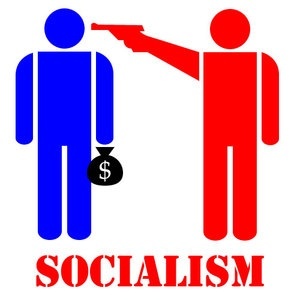 The second bad idea is an economic “solution” that has always failed: Venezuela kept printing money so they could pay for everything their socialist experiment demanded. Of course, Venezuela went the way of every other country that has tried devaluing their currency—hyperinflation has completely wrecked the economy. 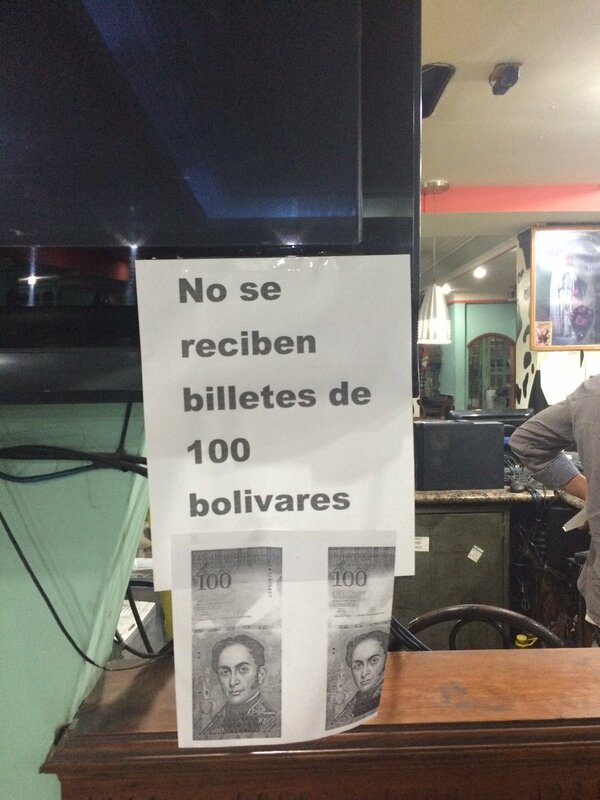 Venezuela’s currency inflated so fast that they couldn’t afford to buy more paper and ink to print more. Socialism and hyper-inflation may not be immediate threats to us. But we can look at the meltdown in Venezuela to see how an economic collapse could play out, if, no matter the cause, it did happen here. The markets and the economy work best when they are not interfered with by the government. The government in Venezuela solves all their problems backwards. No money? Print more. Now they don’t even count money, they weigh it by the kilo. Bread lines stretching for a mile? Make standing in line illegal. No more bread lines. Prices of goods double every other day. Make a law freezing all prices, but keep printing money. So, just because the government says a loaf of bread can only cost 100 bolivars, it doesn’t mean anything when everyone’s millionaires from all the inflation. Any economic disaster we may experience you can expect our elected officials to go head over heels trying to be the next Roosevelt. Anyone remember the bank bailout? Or the current rounds of Quantitative Easing? Or negative interest rates? The government is helping the economy to death. The currency in Venezuela has less buying power every day. People are weighing bricks of paper money that they carry around in wheelbarrows. The people who don’t have enough cash can’t buy food. So they loot it. And those who do have enough may discover that food shortages have left grocery shelves empty. How fast would your neighbors gang up to “redistribute” the food in your pantry if grocery shelves haven’t been stocked in a week? We’ve already seen how the riot police in our own cities have allowed “protesters” to loot grocery stores, service stations, electronics stores, and even auto parts stores to let them “get it out of their system.” That’s nice of them, if it isn’t your neighborhood or your store. 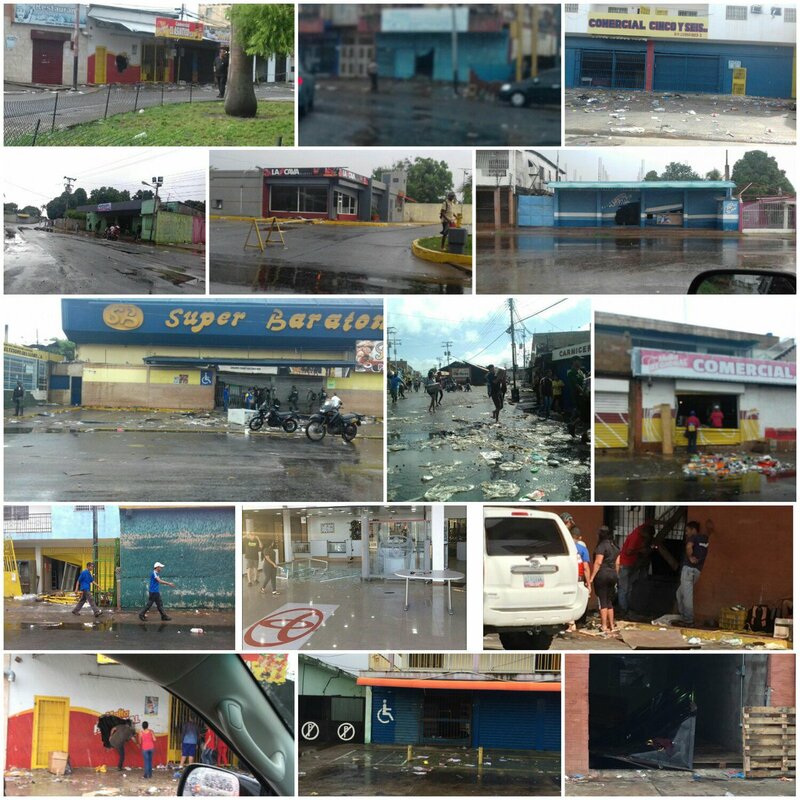 As in Venezuela, any major turmoil will usually see a black market develop. And it’s not always money that people want. Trading your skills and goods can get you further than money in hard times. If the economy experiences a major disruption, like the next great depression, having a reliable food source is the most important factor. Considering you still have shelter and running water, that is. Growing a few plants in your home is a good start. Even if you don’t have a lot of space. You can buy dwarf fruit trees that you can grow on your counter top. Or a few potted plants for vegetables if you have the room for it. Growing a few plants can be a fun hobby and livens up your place, too. And it makes a great contingency in the event of economic trouble. You may not be growing enough to be self-sufficient, but if signs point to trouble coming, you could always add more plants. And having some experience in it before trouble hits would be ideal. Some have said that these ideas have been around since the beginning of recorded history. They were voiced in Plato’s Republic and recently (In a relative sense of the word) in Thomas More’s Utopia published in 1516, and thus 500 years. This incessant failure of their base ideology has necessitated them to create a multitude of synonyms for essentially the same ideas over and over again. Don’t forget the Pilgrims, the Diggers, Harmony, etc. Also, it’s clear that Torcer and I are drinking from the same blood filled cup. – Not Heinlein. Came up with an idea today: have the Boy and Girl Scouts collect aluminum cans send them to bankrupt countries so they can mint coins that are actually worth something! Litter gets picked up, the scouts earn merit badges and the foreign countries get something of value. Win-win all around. And now, Globalism. Some Bondo, new paint and aired up the tires, a little sawdust in the crankcase and it’s ready to roll. As has been the case for 500 years. a political and economic theory of social organization which advocates that the means of production, distribution, and exchange should be owned or regulated by the community as a whole. 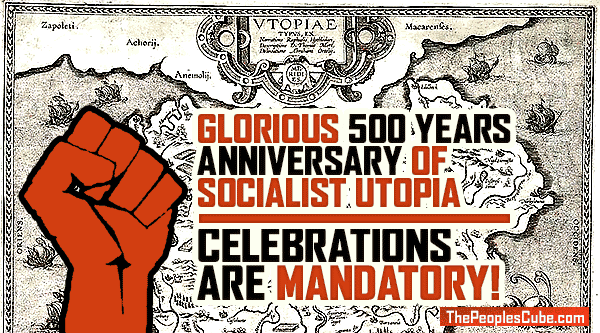 policy or practice based on the political and economic theory of socialism. Such screeds have things like ‘Laws’,‘Civilization’ and even ‘All Elected Government Officials’ as examples of the wonders of Socialism. Of Course, ‘Laws’,‘Civilization’ and even ‘All Elected Government Officials’ have been around for thousands of years and Socialism has only been around for 500 hundred years, but who wants to quibble about FACTS? Trump is Bush’s fault, so anything that’s Trump’s fault is Bush’s fault by association. Though, Ronald Reagan is the prime evil who responsible for all of it. Thank you. Just doing my part for foreign relations. Canadians live Africans too. And Asians and Muslims. So much so they want to give them their very own country. How cool is THAT!! The true history of Thanksgiving won’t be taught in government schools. The good news is they can use their money for that purpose. 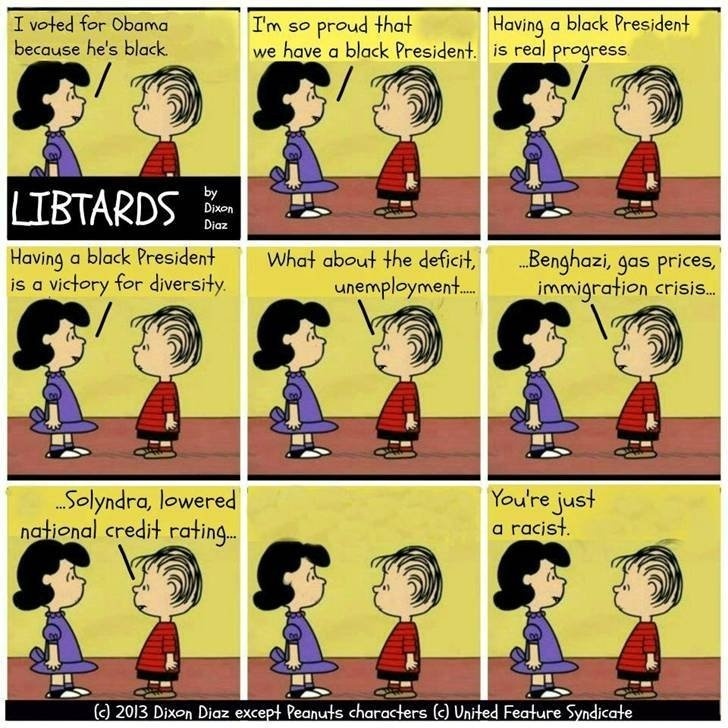 That’s the problem with the nation’s Socialist Left – they cannot debate aside from one word arguments. Yes, I have listened to this several times. “The beatings will continue, until morale improves”.